The Flyer also sports a tablet-specific Sense UI, Scribe technology, and Android 2.3.4. Also included is the new Amazon storefront app, exclusive for U.S. Cellular customers, to shop Amazon.com and access 850,000 Kindle e-books. 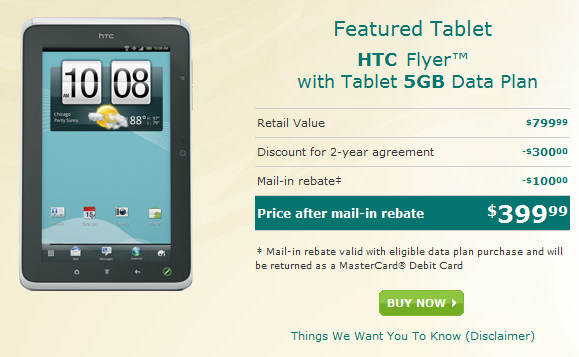 I can't help but think what would have become of this announcement had Best Buy stuck to their $99 pricing of the HTC Flyer --- ouch! Well, there you have it. U.S. Cellular customer now have another tablet choice when shopping for plans. If you'd like more information on plans and pricing, just hit the link below. HTC Flyer now Available on U.S. Cellular originally appeared on AndroidGuys. Motorola to Release XOOM Successors Before Christmas?